After studying product design two years at Saga Art University in Kyoto, Aya Matsunaga moved to Nottingham, England to learn Knitting/Textile. That was when she discovered a felting process that was not so familiar in Japan at the time. She focused on learning this technique and adopted it into her own creations. In 2003, after working in the fashion-textile industry, Matsunaga started producing her own work at her home atelier. Since her first visit to India in her teens, her inspiration sources have largely been taken from trips, maps and sceneries inside and outside of Japan. Her main work is “Wearable Art”. It is created by using felted knit fabrics that are made from wool/cashmere yarns. “Felted knit” can be categorized as a luxury material concerning the “extra” finishing process of fulling. Because the knitted item itself can be already presented as a finished product. Since the fulling process will change the texture and impression of the original fabric very much, it is said the most exciting moment will be when one takes the fabric out of the washing machine after the process is done. 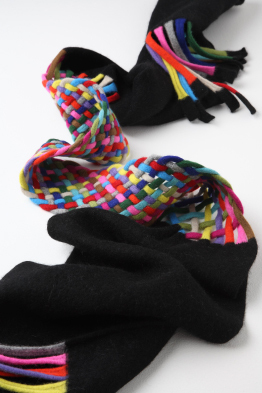 The artist knits with multiple dyed fine wool yarns and completes by fulling the fabric. This is how very complex colour mixtures can be made and this is why the work will obtain an artistic flavor. Despite the characteristic form and novel/ colour mixture, her shawls and accessories fit amazingly to one’s outfit without being eccentric. 2015.12.01〜13 Gallery Nishikawa Kyoto "Knit, Knit, Knit exhibtion"
Please fill out and submit the message form below.